BANGI, 7 August, 2010 – The Governor of Riau Province, Indonesia, Datuk H.M. Rusli has resolved to vigorously train human capital by emphasising on education and the eradication of poverty especially in his province. 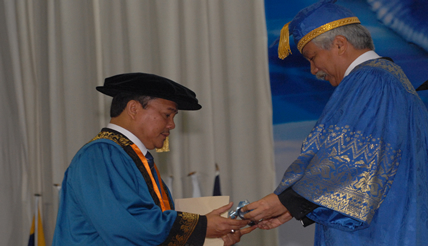 In his acceptance speech after being conferred The Honorary Degree of Doctor of Philosophy in Education Development at the 38th Convocation of Universiti Kebangsaan Malaysia (UKM) here today, he said: “The development and advancement of a nation depended on the quality of its people. The development of infrastructure in villages and with an emphasis on education is conducive in helping to nurture students who are bright, competent and excellent. He, however, cautioned that apart from formal education that emphasised on science and technology, good character building and religious studies have to also be upheld. In his speech, the governor also recounted his experiences during his schooling days when he had to walk through coconut estates, swamps and rowed a sampan for 15 kilometer just to get to school. For that reason after being appointed the Governor of Riau in early 2004, he emphasises on eradicating poverty and illiteracy besides developing infrastructures. Datuk Rusli, the son of H Zainal and Siti Atiqah was born in Mandah, Indragiri Hilir, Riau, Indonesia on 3rd December 1957. He received his early education at Tembilahan and Pekanbaru. 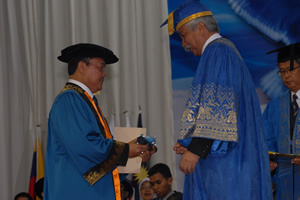 His achievements at school had enabled him to study economics at Riau University followed by his postgraduate studies (Professional Magister) at the renowed Bogor Agricultural Institute. As a leader who is very concerned with the well-being of his people who needed to be uplifted, Rusli resolved to bring development to his province so that the school children would not have to go through what he had experienced. He had since 1988 served in various goverment departments and non-govermental bodies in various capacities. His concern towards development and proven leadership qualities was recognised when he was appointed the Governor of Riau. He is concerned with the wellbeing of the people of Riau and had taken various bold steps draw out the potentials of the people of Riau. Rusli also hoped the development of Riau can be further improved while continuing with his efforts to eliminate poverty through education and having a trained human capital resource. 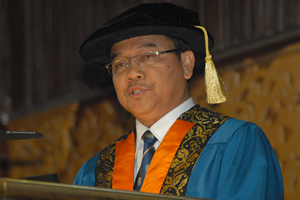 Datuk Rusli believed in providing the best in educations for Riau students who were given scholarships to study in various universities especially in Malaysia. There are currently 300 students from Riau studying in various faculties in UKM.